OH, HEY. So, for the past year or so, Alex has been working with his GetSomeJoy team to develop a digital wellness content and event network to spread joy and promote wellness among Black and brown folks. They're kicking off a new #SelfCareCheckIn movement with a pre-launch conference call with some special guests to share what they've been up to and have a light and casual chat about wellness and how we can be greater together. Self-care is a full-time job, but what does self-care mean to you? How can we engage our communities in the battle against spiritual ashiness? 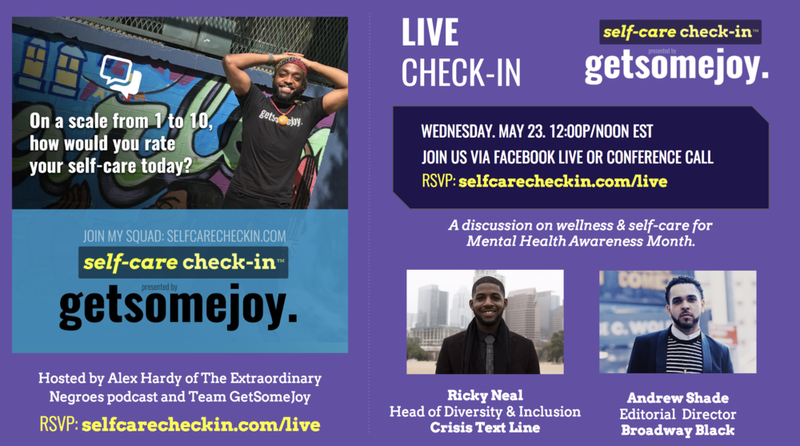 Join mental health advocate Alexander Hardy (The Extraordinary Negroes) and Team GetSomeJoy for a discussion on wellness and self-care for Mental Health Awareness Month, featuring Andrew Shade, Editorial Director of Broadway Black and Ricky Neal, Head of Diversity & Inclusion for Crisis Text Line. Andrew Shade has a burning passion that lies in the arts. Originally from Fort Wayne, IN, he resides in the heart of Harlem, helping to lead the way in building a more diverse and knowledgeable audience in the theatre world. He is the Founder & Editorial Director of Broadway Black, a digital platform dedicated to highlighting the achievements and successes of African-American theatre artists on and off the Broadway stage. Broadway Black has taken the theatre industry by storm & has been excelled by the likes of Ben Vereen, Jennifer Hudson, & Misty Copeland just to name a few.However, Shade feels the greatest achievement has been using his experience and knowledge of the industry to create a community celebrating his own. Recently awarded The Mountaintop Award by Actors Equity Association & BOLDNYC for being a trailblazer. "There is no greater joy than fueling & inspiring those who once thought the theatre was a foreign place to which they were not welcome," he says. He lives the life of the Broadway Black slogan, and shows what can happen "When The Theatre Goes Dark." Ricky Neal is a country boy from Laurens, South Carolina who currently lives in Harlem. An alumnus of Morehouse College, Ricky taught third grade prior to taking positions at Crisis Text Line. He is passionate about the exposure to and quality of mental health care in marginalized communities. You'll be able to join the conversation via conference call so you can listen from wherever you are. And it's $Free.99. Taddow.